We are honored to have been chosen by Kelly & Nick to help them plan their amazing destination wedding at El Dorado Royale in Riviera Maya, Mexico! Thank you for your interest in attending. We will do everything we can to make the travel planning process easy for you. Please take a few minutes to read over the travel information here. If you ever have any questions, please don't hesitate to call or email us. Thank you! We look forward to working with everyone! Why book your travel with Romance Travel Group? 1. The bride and groom are trusting us to plan a successful destination wedding for them. The best way for us to manage their wedding plans is to book and manage every reservation so we can coordinate each detail of the wedding event. 2. We give you personal and individual attention. You will be a real person, and not merely an online confirmation number! We are able to customize your trip any way you like, and can even help if you'd like to extend your stay, change resorts, or bring your family. 3. We monitor your reservation and keep you informed of any changes that could occur. Even after you finalize your booking, we will be with you to make certain everything goes smoothly. 4. You will be part of the wedding group and will appear on our final guest list that gets sent to the resort prior to arrival. 5. We work hard on getting you the best price. If you see a less expensive price for the exact package - dates, airline, airline times, taxes, insurance, transfers, etc. - give us the opportunity to work with you to see if we can get the same price. This way we can book your reservation and you can become part of the wedding party. Usually online prices are lacking something. Please give us the opportunity to help you with this. We can pricematch almost anything. A valid passport is required for all travelers, regardless of age. Passports must be valid for at least 6 months after you return home. 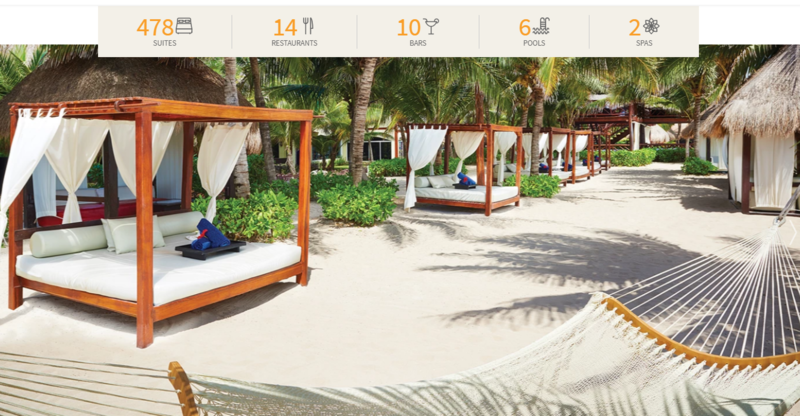 Lose yourself in the bliss of a paradise only found on the shores of Riviera Maya as El Dorado Royale provides the perfect backdrop for both adventure and relaxation. Untouched natural beauty, thrilling excursions, authentic Mayan spa treatments, and unlimited moments spent in poolside bliss come together to create the ultimate experience in adults-only, beachfront luxury. You’ll find personal concierges, beach and pool butlers, a plethora of stunning wedding venues and diverse culinary events. And, with the most restaurants in any of our resorts, farm-to-table is truly our concept as we only use the finest, freshest ingredients including vegetables from our on-property greenhouse. Venture a few steps down the beach to enjoy access to neighboring sister properties, El Dorado Casitas Royale and Generations Riviera Maya. Luxuriously romantic, on a span of secluded beach, the resort provides indulgences from gourmet cuisine, luxury swim-up suites, to a lush health club and personalized concierge service. Situated in the center of the Riviera Maya, facing the beautiful Mexican coast, El Dorado Royale is 25 minutes south of Cancun International Airport, 15 minutes north of Playa del Carmen and 35 minutes south of downtown Cancun. The El Dorado Royale features 478 luxuriously decorated suites featuring an indoor Jacuzzi, bathrobes, terrace, hammocks, coffee maker, turn down service, and daily stocked minibar with beer, water and soft drinks. Luxury abounds in this elegant suite. Enjoy the pampered bliss of a plush king-sized bed or two double beds, contemporary bathrooms with double sinks and glass enclosed showers, a romantic indoor Jacuzzi® for two, and a private terrace or balcony. ​Find yourself captured by the charm of these elegant suites. Enjoy the luxuries of a king-sized bed or double bed, luxury linens, indoor Jacuzzi®, and wood furnishings with authentic decor. Step right into the main pool from the patio of your suite. ​These newly renovated, oversized suites boast 590 square feet of luxury with one king-sized bed, contemporary bathrooms with dual sinks and glass-enclosed showers, a romantic indoor Jacuzzi® for two, and a private terrace or balcony, where guests can relax and enjoy intimate time together. ​The Casita Suite is located in a two-story building, boasting stunning views of the surrounding nature. These romantic suites feature a king-sized bed, modern bathroom with a double sink, exclusive Aguas del Amor™outdoor shower, and a daily stocked minibar. Step out into the spacious balcony and lay on your private double bed to gaze up into the twinkling stars. All rooms must be booked and paid in full by July 10, 2019. There is a $50 late payment penalty applied to reservations that are not paid in full by this date. If the reservation is not paid in full within 7 days of the final payment date, the reservation will automatically cancel and the any payments will be forfeited. Have questions? Call or email me anytime! Thank you!